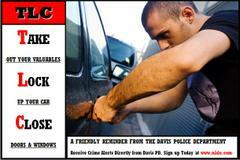 One of the leading property crimes in Davis is vehicle burglaries. There is no set pattern or fixed location where these break-ins usually occur. These crimes are committed throughout the city, particularly in places like apartment complex parking lots, commercial lots, city lots, on city streets, and in residential driveways. In many cases the burglaries occur overnight or in the early morning hours when people are normally sleeping. MANY BURGLARIES CAN BE PREVENTED BY SIMPLY REMOVING THE OPPORTUNITY TO STEAL! - Don’t leave valuables in your car – particularly in plain sight. The safest place to keep your valuables while you are out and about is in the locked trunk of your vehicle. - If you must leave valuable items in your car while out and about, place items out of sight before reaching your destination. - Try to park in busy, well-lit areas. - Lock all doors and roll up windows even if you plan to be gone for only a brief time. - Set any alarm or anti-theft device, if you have one. - Report suspicious activity such as persons walking up and down aisles of parking lots looking into cars or testing door handles. - Never leave your vehicle running and unattended – even for just a minute. - Do not leave a GPS system or satellite radio in plain view, not even the dock. - Carry your registration and insurance card with you. Don’t leave personal identification documents or credit cards in your vehicle. Thieves can use this information to steal your identity and access credit card accounts. - Before getting into your vehicle, give it a visual check. If it has been tampered with, notify the police as soon as possible. Try not to touch or get into the vehicle. There is a possibility that fingerprints can be collected from your vehicle for evidence. - Mark your valuables! As a last line of defense (not really to prevent theft as much as to aid in recovery). We suggest inscribing/engraving a “personal identifier” on all valuables by using your driver’s license number, prefaced by your DL “state”, such as CA-U0077139. Remember the single most effect way to deter vehicle burglaries is a little “TLC”, Take out your valuables, Lock your vehicle, and Close doors and windows.